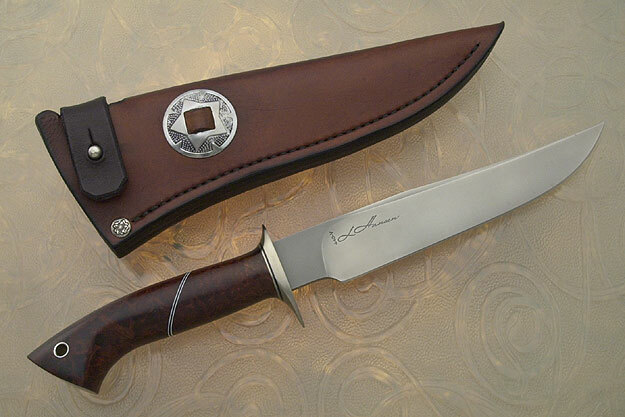 Description: This large hunter enjoys the same excellent fit and finish as Lonnie's other pieces: everything fits seamlessly together to perfection. The black and white spacers in the handle are almost invisible to the touch. The balance point is right behind the guard, allowing for fingertip control. The contoured handle and long ricasso allow for a variety of grips. 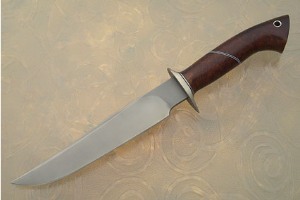 The knife feels sturdy and secure in the hand. The blade was hardened to 58-59 Rc in an inert atmosphere, subzero quenched, and double tempered for superior quality and strength by Paul Bos. 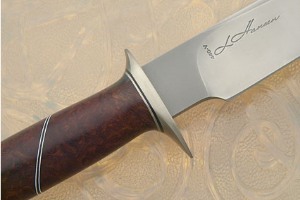 It's easy to see why Lonnie named this one "The Dragon Slayer".